On Monday, 29 May, a Mars-Saturn opposition might pull the brakes on an action plan that’s been firing up your engine lately. Mars is the go-getter of the skies whilst Saturn is the planetary taskmaster; Mars says COME ON LET’S GO whereas Saturn says WAIT HAVE YOU COMPLETED THE ADMIN CORRECTLY DID YOU ASK FOR PERMISSION AND WHY IS YOUR ROOM SUCH A MESS CAN YOU NOT. As you can tell, the energies of these two planets are pretty much the polar opposites of each other. Saturn is currently retrograde, which amps up the “grumpy disciplinarian” nature of this planet. So you might expect a slightly heightened chance of a person, circumstance or incident wet-blanketing your exciting business idea or travel plans; those with birth charts that prominently feature Saturn might also find themselves slowing down or even pulling the plug on their own plans. This is not necessarily a bad thing if there are issues that need our attention. As always, wisdom is found in the middle way – somewhere in between the two extremes. The lesson to learn from Monday’s Mars-Saturn opposition is to navigate our course forward effectively, with the boldness of Mars and the conscientiousness of Saturn. Be clear about this learning point, and we’re all good. Onward to This Week’s Tarot! LEFT: SEVEN OF RODS. This card represents self-assertion. Depicted by a man using a rod to defend himself against the onslaught of six armed and unseen assailants, the Seven of Rods encourages us to stand our ground on matters that require conviction and integrity. The defensive aspect of this card is clearly portrayed here, but you’ll notice that our man is calm even under pressure. the Seven of Rods encourages us to stand our ground on matters that require conviction and integrity. MIDDLE: THE MOON REVERSED. Upright, The Moon signifies deep confusion; upside down, the perils of delusion are largely overcome, and clarity is about to break through. There could be a need to let go of the old and welcome the new in order for this to happen – a breakthrough especially in terms of limiting beliefs and assumptions. What couldn’t be done before might be possible now. What couldn’t be done before might be possible now. RIGHT: KNIGHT OF SWORDS. This Knight represents effective action taken via the use of logical thinking, clear communication, and a calm approach towards problem-solving. You won’t catch this Knight rushing into something without a strategy. Back to the Mars-Saturn opposition I mentioned earlier: the Knight of Swords urges us to act, but also to switch on the brain before we engage the gears. 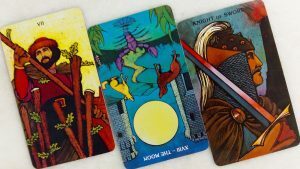 the Knight of Swords urges us to act, but also to switch on the brain before we engage the gears. The combined numbers of this spread (7 + 18 = 25, 2 + 5 = 7) add up to Number 7, a numerological energy that encourages personal breakthrough and the transcendence of limitations. 7 energies are very independent, though, so we’re expected to make the big decisions that matter mostly (if not entirely) by ourselves.